Start with strong size 8 hook. Nymphs are often overlooked by anglers new to trout fishing and fly tying. Perhaps the reason is that they are so small alongside a feathered lure we might wonder how a trout or salmon can even see them. 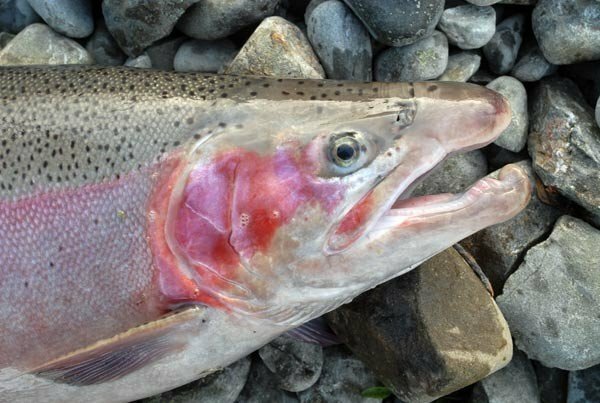 Trout in particular typically feed on small insects. Mostly they do this by sitting, more or less, in one place and waiting for food items to drift past. Some of these food items will be floating on the surface but the majority will be drifting past under the water. A nymph fly is used by anglers to imitate a such a sunken insect drifting along with the current. As each item drifts into the trout’s field of vision it must make a decision about, is this food? Will I take it? Shall I ignore it either because the fish is not hungry enough, or doesn’t consider the food item to be worth the effort? When the current is slow the trout has more time to make a decision. In faster water, the fish has much less time. In fast-moving turbulent white-water, it can really only snap at whatever roughly fits the bill before the chance is gone! Wind the vinyl rib up to the lead wire and tie off. The rubber legs nymph is popular because the legs impart realism and movement to the fly. 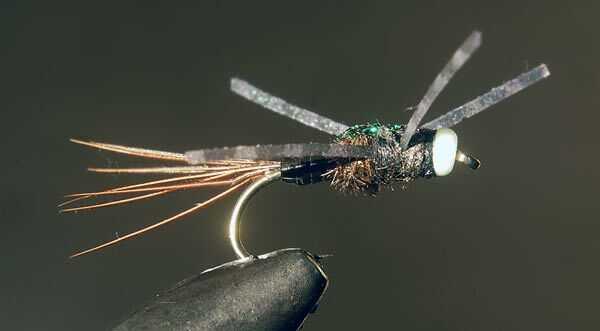 Rubber legs make the fly look more like a fly to the angler. I guess this gives us more confidence that the fly will work. Whichever way you look at it a fly with soft wiggly rubber legs looks more realistic. 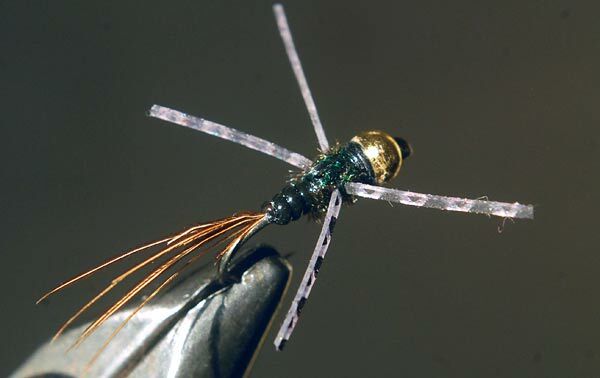 The legs move about making the fly appear more lifelike to trout. Keep in mind that the sunken insect is going to drift no faster or slower than the speed of the moving water. Therefore when fishing a nymph in a river or a canal you ideally need to allow the nymph to dead-drift along with the current. You do not want to be retrieving line so that it looks to be swimming against the current like a smelt or bully. The rubber legs will still move around even as the nymph is drifting with the current. When lake fishing, however, a wiggle legs nymph won’t have any movement at all unless the angler imparts some by twitching the line. Tie about 5 or 6 peacock herls on the top then wind them around to the head. Wiggle legs nymphs have proven deadly in the Twizel canals both in the white-water beneath the intakes, and for blind dead-drifting in the canals themselves. When the fish are a bit “gun” shy from having seen a lot of hardware they are more inclined to take nymphs than larger softbaits. 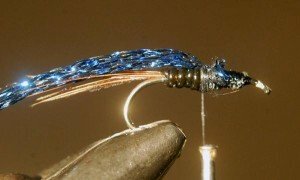 I have had success with this Bluebottle Pheasant Tail nymph. Just as importantly I gave a few to several other anglers down at the canals and they caught fish for them too. 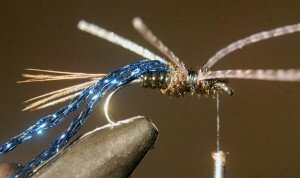 This nymph I have weighted for use in fast water. If you need to get your flies down deep to the waiting fish then some lead is necessary. In the canals, I fish these on spinning gear and add a couple of pinch on leads to take them down to fishing depth. Use only as much weight as you need to. Tie the legs in at the sides. Then bring the blue Diamond Braid over and tie down at the head. If you are going to be fishing the canals for really big browns and rainbows it is most important to tie your nymphs on strong hooks. On several of my recent trips to the canals, I was amazed to see how many angers were losing big fish as a result of their gear giving way. Either their hooks were straightening or their leaders breaking often at the double surgeon’s knot used to tie a dropper for a second nymph. A popular rig is a softbait minnow on the bottom for weight and a nymph above on a dropper. Tying the bottom trace to the hook bend of the nymph above looks weaker but seems to be stronger than a double surgeon’s knot in 15-17lb fluorocarbon. When tying up rigs for the canals keep in mind that if you have a twenty pound plus rainbow on for over an hour any weak points are going to be found out! I’m using Black Magic Extra Strong A Wet Fly and Nymph Hooks in size 8. These are high carbon chemically sharpened lure hooks. I purchased a book of 250 of these a while ago. They were not expensive but have proven to be up to the task on some very big fish. You could use something else but just be sure it is not going to bend or snap on a big fish. 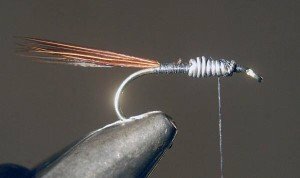 After under-binding tie in about half a dozen pheasant tail whisks so that they end about half a hook length behind the fly. Ten back the thread up to halfway and tie in the end of some lead wire. Now wrap the wire around the hook leaving room for the head. Wrap plenty of thread around the lead wire to hold it in place and coat with cement. Don’t go mad on the lead. We want enough to take the nymph down deep not turn it into a sinker! Wiggle Legs Bluebottle Pheasant Tail Nymph. Next, I tie on the end of the brown vinyl rib and wrap it around the hook back to the lead wire. You could just as well omit this and use herl instead. I like the vinyl rib. It makes the fly look more insect-like. 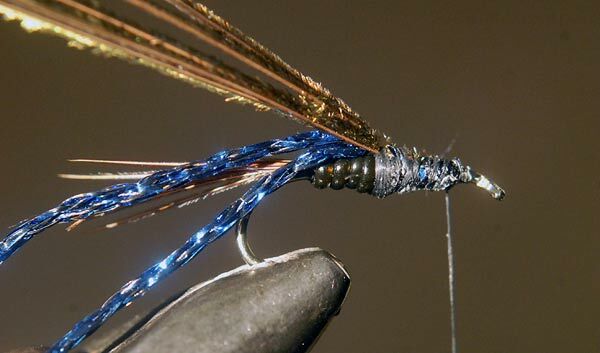 Next tie on a double length of blue Diamond Braid on top with it running towards the rear of the fly. Layover this 4 or 5 peacock herls and tie down. Then wrap the herl down to the head and tie off. 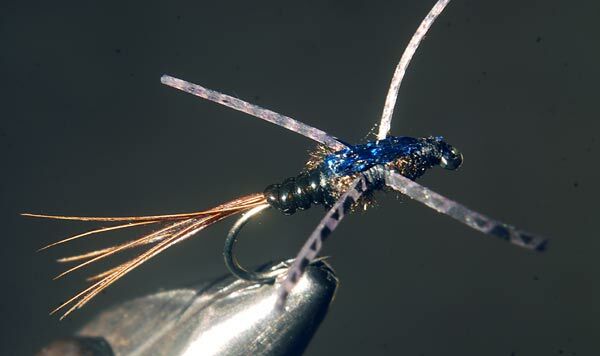 I like to coat the fly under the herl with cement first for a stronger fly. Cut two lengths of rubber legs and tie each on the side of the hook. They flare out when tied on so you may need to adjust them for position before adding half a dozen wraps of thread to lock them in place. Finally, pull the Diamond Braid over the top to for the blue back, tie down and cut off at the head. After finishing the head with the thread I also add a little cement over the back of the fly for extra strength. A gold head variant for a little extra weight and flash. These are simple and quick to tie. They are very effective on trout, especially in the Twizel canals. 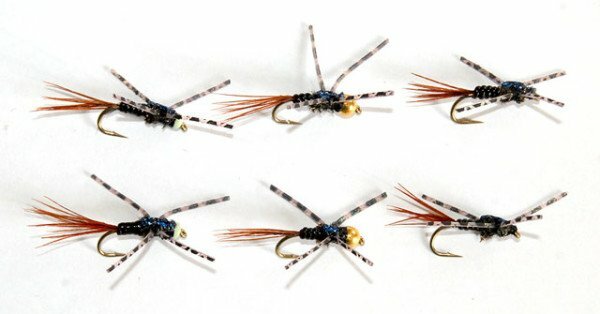 I also tie up several variations of the Wiggle Legs Bluebottle Pheasant Tail Nymph. I have included a couple here. Firstly the gold head version. This gives more weight and flash on a bright sunny day. The gold head also adds weight. A fluorescent head variant for use at night and in deep water. Finally, I have a fluorescent version made with an Angel Bead behind the eye of the hook. This glow-in-the-dark version is not just effective at night. It also works in deep water during the day where little light penetrates. These two versions have green backs so they can be sunken green-bottle blowflies. When fishing for really big trout and salmon with nymphs it essential to use strong hooks. These are only size 8 but they don’t open out. The first two are weighted with Angel Bead heads. The second two have Gold Heads which also supple weight. The third pair is weighted. You can also fish one of these on a dropper above your softbait in the Twizel Canals. However, think very hard about the security of any knots used as they will surely be the weak point when you hook a big fish. I know blowflies like warmer temperatures but trout definitely accept them even when there is snow on the grown. The Wiggle Legs Bluebottle Pheasant Tail Nymph is one of the best flies for fishing the Twizel Canals. Big rainbow trout that was taken on a nymph in the Oahu A Canal near Twizel, in the Mackenzie Country. If you found this article useful please subscribe to the Fishingmag Trout & Salmon Email Newsletter. Get free fishing ebooks, updates, and our latest article releases. 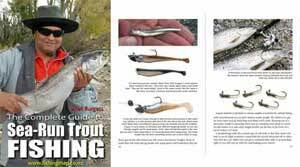 Free 100 page ebook The Complete Guide to Sea-Run Trout Fishing – Download Now.